What a bad blogger I’ve been! These past few months have been super busy, but life seems to be back to normal again. So my return to blogging begins…. My husband, Christopher, recently requested that I make one of his favorite childhood dishes. His mom used to make beef stroganoff using ground beef and he always remembered it being delicious. 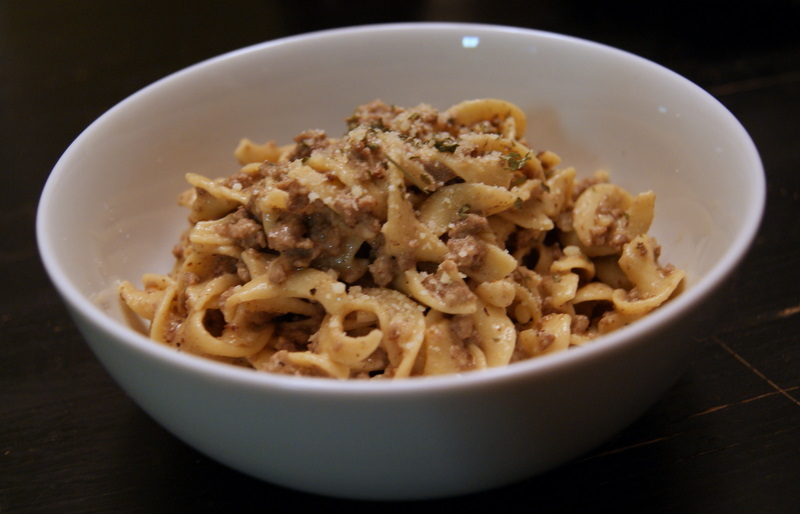 As for me, the first thing I think about when I think of beef stroganoff is egg noodles, which aren’t really my favorite. So, I decided to put my own epicurean needs aside and make figure out how to make this dish for him. After a quick search online, I found an Emeril Lagasse recipe that I thought I could modify a bit to add some flavor. Turns out I am a beef stroganoff fan! It’s very filling and comforting. With the addition of a few of my own ingredients, this turned out to be a something I wouldn’t mind eating again….egg noodles and all! Boil egg noodles for 7-8 minutes. While noodles cook, heat olive oil in large skillet and add meat and all spices. Cook on medium high heat until browned and drain excess fat. Drain noodles and set aside. Lower heat to medium and add onions and garlic and cook for 4 minutes until softened. Remove pan from heat and add red wine, then return the skillet to heat. Cook for a 1-2 minutes – this will give the alcohol time to cook out. Add water, bouillon cube, sour cream, heavy cream and parmesan. Once the bouillon cube has dissolved into the liquid, add the egg noodles. Stir until noodles are covered in meat/sauce. Add more salt/pepper to taste. If sauce is too thick, add water until desired consistency is reached. If sauce is too thin, add more grated parmesan and a bit of cream – this should help thicken it up quickly. Garnish with additional parsley flakes and parmesan. Enjoy! Side note – this dish is frequently made with mushrooms, but since Christopher hates them, I omitted them from this recipe. If you would like to include them, though, use 1 cup sliced button mushrooms and add them to the skillet when adding the onions and garlic.